A bone x-ray makes images of any bone in the body, including the hand, wrist, arm, elbow, shoulder, foot, ankle, leg (shin), knee, thigh, hip, pelvis or spine. 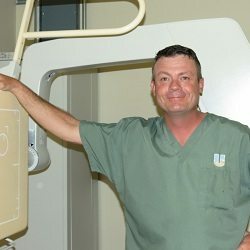 Upper and lower gastrointestinal tract radiography, also called an upper or lower GI, is an x-ray examination of the esophagus, stomach, or lower intestine and first par of the small intestine. Images are produced using a special form of x-ray called fluoroscopy and an orally ingested contrast material such as barium. Fragments following treatment of a fracture.